Vitamix, a brand that no need to be introduced anymore. Established in 1921, Vitamix has grown to be the leading company in blending technology. Starting from a healthy food business, it has developed into the most famous blender associated with high performance. The Vitamix Professional Series 750 Blender is another blender from that same company. It is fully packed with lots of features, from making smoothies, to making frozen dessert, to kneading dough, and even slicing and cutting ingredients! It’s the only thing you need in your kitchen to prepare your food effortlessly and conveniently. Features: 5 preprogrammed settings (smoothies, frozen desserts, hot soup, purees, self cleaning cycle), 10 variable speed settings, radial cooling fan and thermal protection system to prevent overheat of motor and processor unit. Older designs of the Vitamix has always been tall. The Vitamix 5200 is an example of the Classic Series of the Vitamix blenders where the pitcher is slim and too tall to fit under kitchen cabinets prompting many comments from users. Well, for one the blender is that tall partly because of the large and sturdy base – larger than most blenders out there. This proves how Vitamix blender’s motor and internal parts are bigger and more robust than their competitors. Bigger engine will always make your car faster right? The Next Generation blenders by Vitamix just change it all. The Vitamix Professional 750 is the middle product of this series. The base height is kept the same, but the pitcher is made shorter, but wider and still retaining its 64 ounce capacity. The pitcher is BPA free and made by shatterproof Eastman Tritan Copolyester. With this, you will get a wider 4″ blades that will give better blending because of the increase cutting area of the blade. 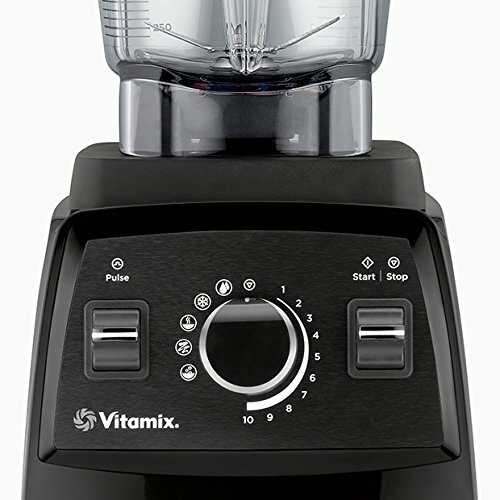 Vitamix claims this blender will fit under most kitchen cabinets. If you have a very low cabinet, you can just detach the pitcher and put it side by side with the base. The blender comes in 7.7 x 9.4 x 17.5 inches dimension. It weighs 12.5 pounds and is very sturdy and won’t shake while blending. As I’ve mentioned before, Vitamix blender base is bigger and heavier than most blenders out there. It seems they thoroughly think this to make it big and heavy so that users won’t need to hold the blender to stabilize it while blender at the highest speed. Let’s move on to the control panel. The power switch of the blender is positioned at the lower right side of the base. On the front control panel, you will see a switch for Start/Stop (to start operation) on the right, a circle knob that you can rotate (rotate right to select any one of the 10 variable speed and rotate left to select any 5 of the preprogrammed cycles) on the center and to the left you will see a pulse switch. My comment is only on the programs knob. Vitamix has opted to use only symbols to indicate their 5 programs which are smoothies, frozen desserts, hot soup, purees and self cleaning cycle. It looks really simplistic and gorgeous, but lacks usability and ease of understanding. Only the frozen dessert and soup icons are self-explanatory. It would be much better if they could just write the description next to the icon for easy understanding. I really don’t want to refer to the manuals every time I’m not sure which function is which. Older people, specifically, would have quite a hard time to decipher to small icons. Besides that, the knob feels good and easy to operate. 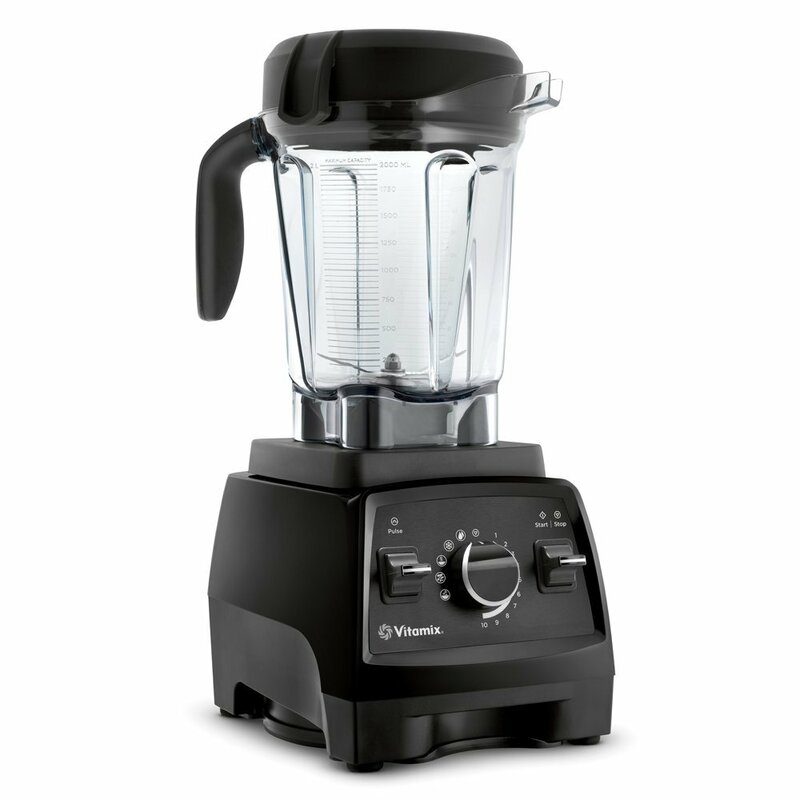 Vitamix Professional 750 Series Blender is the rightful jack of all trades of a blender. It just can do everything, all from the same blender. Smoothies, frozen desserts, soups, purees, preparing ingredients (chopping, slicing, etc), ice cream, sorbet and lots more can be done easily using this blender. It’s all thanks to the super powerful motor that the blender has (more on that later on). The 5 preprogrammed settings will just make your life easier. Simply put your ingredients into the pitcher, switch on the blender and simply pick the setting you want. Walk away and your delicious smoothie/soup/sorbet will be ready in less than a minute. For the full range of items that you can do with the Vitamix Professional 750, watch the video below. It shows the 13 possible use of the blender! Now that’s a lot of usage! As mentioned earlier, in a bid to reduce the height of their blender, Vitamix’s engineers designed a wider base. And they also equipped a wider 4″ blades with the new design. The motor is a 1440 watt motor, with a peak power of 2.2 horsepower or 1640 watt. 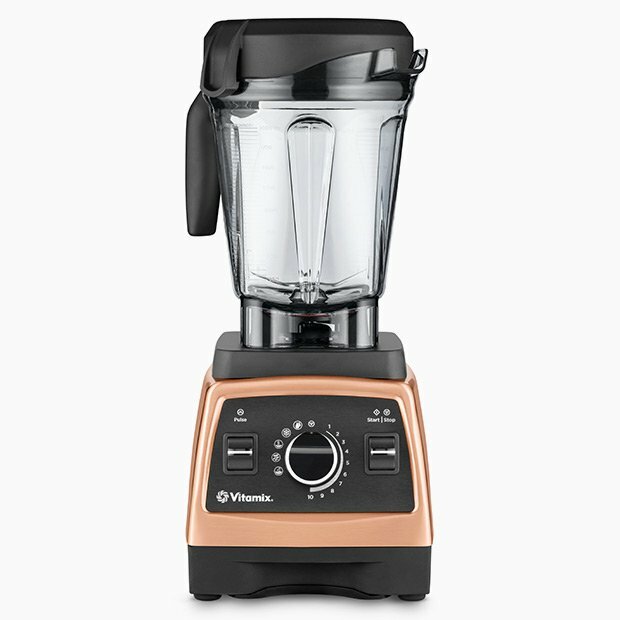 Vitamix claims that this new generation’s motor is equipped with their latest sound technology, making it quieter even when blending the toughest material. Not only that, there is a radial cooling fan and thermal protection system in its base – critical parts to make sure the blender won’t overheat while making you that delicious nut butter. This will undoubtedly increase its durability so that you can use it everyday, for years to come. A thing that I need to remind everyone is there are two types of blades for Vitamix Professional 750. 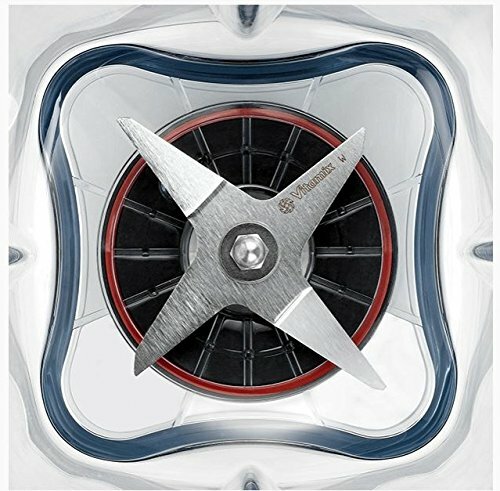 As stated in their instruction manual,the default blade comes with the wet blade – marked with a “W” and have triangle shape blades. Vitamix suggests that it is best to use a dry blade which can be purchases separately. I believe it is best to follow this as you don’t want to chip away your blade blending hard ingredients. The Vitamix Professional 750 Series Blender is an all in one blender that will suits your every needs. It can do lots of different things, all in the convenient of one product. Vitamix’s powerful motor and its performance is somewhat legendary and does not need to be mentioned anymore. For sure, the price is quite high for a blender, but consider this a long term investment for you and your family. Besides, you will get a 7-year full warranty from Vitamix with your purchase. That means, if you buy a low quality $90 blender which you are going to replace every year, by the 7th year, the amount of money you spent would already be enough to buy you this blender. With your purchase, you will get a tamper, cookbook, manual guide and a DVD for instructions. Check out also the Vitamix website for lots of delicious recipes that you can try. So what are you waiting for? The best place to buy the Vitamix Professional 750 Series Blender is Amazon. It offers the cheapest price right now. Click the link below to check out the item on Amazon. I’ve been looking into homemade smoothies for awhile. The last blender I bought broke so quickly and was bulky. I just go more frustrated by it then helped by it. I appreciate the detailed review. Can you tell me how hard it is to clean? Hi Jennifer. I’m really sorry that your last blender don’t last long. It’s the thing with cheap blenders, you just not as durable as the other big brands e.g Vitamix, Blendtec, Breville, etc. The cleaning is very simple. You just need to add some warm water and a few drops of soap detergent into the blender and use the self-cleaning cycle. It will blend the soap water for about 30 sec or so cleaning the whole blender. Just remember, the longer you take to wash your blender after using, the harder the stain will come off as it has harden to the pitcher wall. Thanks for reading. Do contact me for more questions. I’ll be glad to help. Cheers! Thanks for providing this Vitamix Professional Series 750 Blender Review. It looks as though you can do some quite complex “dishes” and that it’s a very flexible tool. As a general rule I’m looking at a blender for smoothies and soup making. Any ideas how long it typically takes to make both? Hi Nate! Yes the Vitamix Professional Series 750 is a very convenient tool. You can do a LOT with it. Basically for smoothies, the automatic setting “Smoothie” will run the blender for about 1 minute. That is basically the time required for most blenders to really pulverize the ingredients and creating silky smoothies. For soups, we have to run the blender for a longer time i.e 5-6 minutes. The blender needs that long time to create heat from the friction of the blades. The good thing with this blender is you have the automatic setting that will do it for you. Just put the ingredients, use the setting and walk away. No need to supervise anything at all. I am interested in getting a blender and this one certainly looks like it’s one that I could use. One thing that I first look at is the warranty and this one offering 7 years then it must be good. Also that the brand has been going since 1921, it must be doing something right. With the DVD that is included do you get recipes as well. I would like to get some so I can make something really nice with it. Hi Owain. You wouldn’t go wrong with this Vitamix =). 7 years warranty really gives you a peace of mind for your purchase. And yes you are right about Vitamix’s long time legacy. It’s been much longer than most blender manufacturers out there and for sure they have learned and improved over the course of 8 decades. Do not worry, there is a cookbook included with the purchase Owain. You can also go to Vitamix’s website to look at their recipes if you prefer using a smartphone of your ipads. It is quite easy to navigate through the site finding the recipe you like since they have segregated recipes based on product series, recipe types, difficulty level and many more. There are over 500+ recipes for you to choose from. You can click this link here to go to Vitamix’s recipe page. I am searching for a really good mixer that will last for a while, even if it costs more. I came across this mixer and I am just wondering how hard is it to clean? I presume those blades can be taken off? Also, is the 7-year warranty meant for all the parts of the blender? I don’t think I’ve ever seen a blender that offers a warranty this long. Do you have any suggestions regarding the recipes? Something with fruit would be nice. Hi Dejan. For a good lasting mixer or blender, then you’ve come to the right place. Vitamix has been a staple name for good quality blenders for decades. Their 7-years warranty is good for all parts of the blender and just shows how they take pride in their machine’s quality. And cleaning it is a breeze – just put some warm water inside the jar (you can also put some detergent in it) and use the self-cleaning cycle. The blender will mix the water and take all the leftovers out. Simply rinse it and it’s good to go. Dejan, you can always check out my smoothie recipe section for some examples. Here is one about banana that’s very delicious for those starting out with smoothies.